Laser Light Communications, one of the first companies to attempt to commercialize network connectivity via laser beams from satellites orbiting the Earth, has chosen Equinix data centers to act as the first hubs where companies will be able to access the hybrid space-terrestrial network it is planning to launch, the companies announced Tuesday. The world’s bandwidth needs continue to skyrocket, but not every place on the planet is easily accessible for construction of terrestrial networks, prompting some companies to invest in commercializing connectivity via optical signals sent through the air, or, in Laser Light’s case, through the atmosphere. The technology, called free-space optical communication, was born out of decades of research by government space and defense agencies in the US, Europe, and Japan, according to Laser Light. It is capable of transmitting a lot more bandwidth than radio-based satellite tech in use today. Laser Light’s plan is to beam IP network bandwidth from eight to 12 Medium Earth Orbit satellites, forming what the company dubbed the HALO constellation. The satellites will transmit data to each other via 200Gbps optical crosslinks and send data to ground sites via 100Gbps links. The intra-satellite speed is about 100 times faster than radio links can offer. 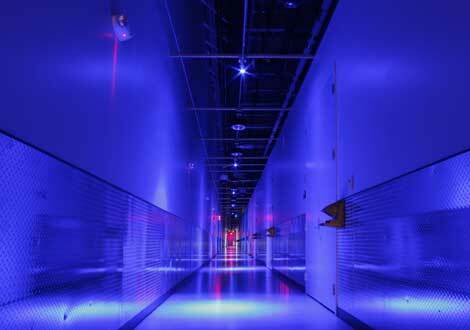 Equinix’s DC11 data center in Ashburn, Virginia, will be the first such ground site. Laser Light expects to add more Points of Presence in Equinix facilities in South America, Europe, Middle East, and Asia Pacific in the future. 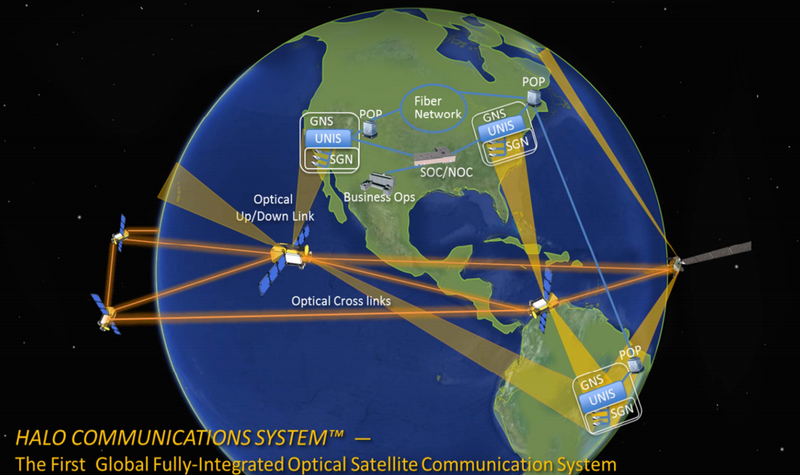 It is crucial for the space network to have many ground sites to beam connectivity into because of interference caused by clouds and optical turbulence, according to a 2014 presentation by Laser Light at a telco conference in Honolulu. “Multiple geographically diverse ground sites are required to mitigate the impact of atmospherics,” one of the slides read. In other words, if weather prevents one site from getting a clear satellite signal, the signal is picked up by a backup site. The space network will augment terrestrial networks, providing not only more bandwidth but also backup links in cases of terrestrial network failures, such as broken submarine cables. Eventually, Laser Light, a subsidiary of Pegasus Global Holdings, expects to cover most of the world’s interconnection hubs, such as carrier hotels and submarine cable landing stations. The deal with Equinix will not only enable the company to distribute the terrestrial portion of its network through the global footprint of the world’s largest data center provider, it will enable it to sell its services, brand SpaceCable, to carriers, enterprises, and government agencies that host equipment in Equinix facilities.